This report represents the work and results accomplished during the initial phase of work done on Project Pioneer, with respect to sequestering CO2 in a deep geological formation. This report will also discuss some early geological studies (one of which preceded the inception of Pioneer), the drilling and testing of the evaluation well, as well as the detailed geological and reservoir models and the risk analysis that enabled the Project to develop a sequestration and MMV program complete with a cost estimate and schedule. Carbon capture and storage (CCS) projects could be considered a special type of oil and gas capital project. The standard approach used for risk management of oil and gas capital projects is applicable to CCS projects. Also the uniqueness of CCS projects as well as the characteristics of a particular project should influence the design of the Risk Management System (RMS). Both general CCS challenges and features specific to Project Pioneer were taken into account when shaping the project risk management system that is described in this report. This report describes the set-up and outcomes of the competitive selection process that was followed by Project Pioneer to select its capture technology. This Project would have been one of the first carbon capture and storage (CCS) projects to utilise an integrated approach for CCS, and was expected to serve as a prototype for the long-term, commercial-scale application and integration of CCS technologies to achieve reductions in greenhouse gas emissions. Construction of the carbon catpure facility (CFF) was planned to commence mid-2013, and was planned to be completed and commissioned ready for commercial operation in December 2015. The EPC contract negotiated but not signed with MHI was a fixed price, turnkey contract and included the design, procurement, construction, commissioning, warranty, and performance guarantee of the complete CCF plant. This report summarises the proceedings of the Carbon Capture and Storage Systems Integration Workshop held in Calgary, Alberta, Canada, in September 2012. The workshop was attended by experienced executives and professionals involved in carbon capture and storage (CCS) projects. It considered case studies, challenges and opportunities about systems integration in existing CCS projects. Key learnings and next steps are noted. This report discusses the basics of CO2 transportation and delves deeper into the design and safety considerations of the two pipelines systems that were proposed for Project Pioneer. Project Pioneer was intended to be among the world's largest, fully-integrated carbon capture and storage (CCS) systems. The CO2 was to be transported for enhanced oil recovery (EOR) in nearby oil fields as well as for permanent storage in deep saline formations. 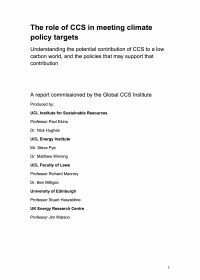 The report also explores lessons learnt from existing CO2 pipelines that are used elsewhere. Project Pioneer involves the construction of a large-scale carbon capture facility at the Keephills 3 coal-fired power plant west of Edmonton, Alberta. The intent of this report is to provide guidance and reporting on the existing regulatory gaps that Canada and Alberta face as it relates to Project Pioneer and other CCS projects. This report will also seek to clearly outline for others what regulatory frameworks currently exist in both jurisdictions, as well as outline some of the work that the province of Alberta is conducting in the area of regulatory frameworks and enhanced collaboration with pertinent partners and levels of government. Project Pioneer would have been one of the first carbon capture and storage (CCS) projects to utilise an integrated approach for CCS, and was expected to serve as a prototype for the long-term, commercial-scale application and integration of CCS technologies to achieve reductions in greenhouse gas emissions. This summary report peruses at a high-level for the reader, Project Pioneer’s analysis of labour markets through expected industrial activity, a brief overview of the construction advisory committee, analysis of major risks for construction of the project, and finally some concluding notes. This report describes the consortium that was established to deliver Project Pioneer. This Project would have been one of the first carbon capture and storage (CCS) projects to utilise an integrated approach for CCS, and was expected to serve as a prototype for the long-term, commercial-scale application and integration of CCS technologies to achieve reductions in greenhouse gas emissions. 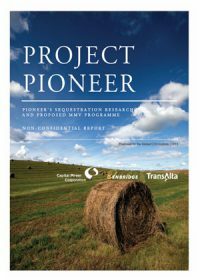 This report describes a preliminary evaluation of the economic impacts of Project Pioneer on the province of Alberta, completed in 2009 at the inception of the project. The project is expected to generate between CA$2 billion and CA$3 billion in Alberta GDP (depending on future oil prices) over this 14-year period. The increases in Labour Income are expected to be about CA$700 million, and combined provincial and municipal revenues are estimated to grow by between CA$225 million and CA$850 million. The estimated impact on Federal Government revenue is between CA$260 and CA$330 million, while total employment is expected to be approximately 8800 person years. In this report, TransAlta also estimates the economic impacts that might accrue if the technology and refinements from Project Pioneer are successful and more broadly applied to other sectors. Pioneer is currently conducting a follow-up economic evaluation through Q1/2011 and Q2/2012. The results of this report will become available on the Institute’s website at a later stage in 2012. Project Pioneer will be one of the first carbon capture and storage projects to utilise an integrated approach for CCS, and is expected to serve as a prototype for the long-term, commercial-scale application and integration of CCS technologies to achieve reductions in greenhouse gas emissions. Project Pioneer is being proposed to capture 1 million tons (Mt) of carbon dioxide (CO2) annually from the Keephills 3 coal-fired power plant, which is located approximately 70 km west of Edmonton, Alberta, and is jointly owned by TransAlta and Capital Power.